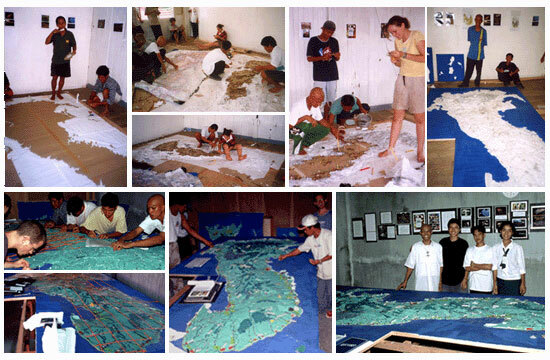 The 1:10,000 scale 3D model of Polillo Islands Philippines was completed in year 2001 to determine the extent and distribution of remaining forest fragments. Much of Polillo’s unique wildlife is dependent on lowland forest. However prior to this study only limited speculative information was available about the distribution and extent of such forest remaining in the Polillo Islands. To produce relevant conservation plans at an appropriate geographical scale, more complete spatial records were necessary. More interestingly in the process, the researchers verified the relative “accuracy” of data generated via the P3DM process versus GPS gathered data sets. Thematic maps: No satellite imagery was available for the Polillo Islands, and due to the extensive and demanding terrain comprehensive ground surveys were not feasible. Therefore community mapping was considered to be an indispensable tool and a P3DM exercise was conducted to determine the extent and distribution of forest. This initially involved working with local representatives and college students to construct a 10 square meter 3D model of the islands wherein each 10m contour based on topographic maps is represented by a sheet of corrugated cardboard and secured by papier-mâché. Secondly selected GPS points were mapped onto the model to assist participants form a mental map of their locality. Discussions with key informants both in the field and during model construction formed the basis of land-use maps. These maps were subsequently ground-truthed using Global Positioning Systems (GPS) data collected during fieldwork and the accuracy of participants’ information assessed. The inaccessibility of certain areas coupled to inevitable time restrictions required at times the knowledge of informants to stand alone. The mapping project was coordinated with ecological surveys in order to produce a spatially coherent understanding of the forest, wildlife and natural resources in the Polillo Islands. Conclusions by the researchers: In some areas forest and coconuts form a complex interlinked matrix, which cannot be delineated further at this scale, consequently forest cover on the maps is overestimated. However the 3D participatory mapping technique effectively provides an overall picture of land-use, incorporating sufficient data to provide a strong framework upon which ideas and recommendations can be formulated. The reliability of most informants’ contributions corresponded very closely to the GPS data that was collected. The model in SLPC is freely accessible for all and provides an invaluable educational and planning tool. The map does not claim to be all encompassing and can be both improved and made more accurate as knowledge grows. This process is currently ongoing and overseen diligently by Hannibal Disanta, a student at SLPC. The map aims to raise awareness of the geography and land use of Polillo. The 3D model is visually effective, easy to understand and we hope of interest to all, and welcomes additional information. Forested regions marked on the map vary in quality, partly due to the extent of logging and partly due to the underlying geology and landscape. A brief description of forest is given where appropriate in the site descriptions, for more detail refer to the Forestry report. From this knowledge gained it is possible to identify priority forest areas in need of protection.